JNN 10 Aug 2014 Gaza : Israeli shelling killed a 10-year-old boy at a mosque and four other people in separate attacks on Friday, medics said. They were the first deaths since fighting began again following the expiration of a three-day truce. Health ministry spokesperson Ashraf al-Qudra said the boy, Ibrahim al-Dawawisa, was killed at the Nour al-Mohammedi mosque in the Sheikh Radwan neighborhood, according to AFP. Six others were injured in that attack, and five others wounded in other strikes, as Israeli occupation forces bombed a number of other sites across Gaza Friday. Palestinians renewed rocket fire from the besieged strip after the 72-hour truce ended at 8:00 am Friday, in which Israel said two people were injured. The latest killings bring to 1,894 the number of Palestinians killed over 32 days of Israel’s terror campaign against Gaza. Another 9,805 have been injured. Israel says 64 of its soldiers and three civilians have died in the fighting that began on July 8, after a surge in Palestinian rocket salvoes into Israel. The interior ministry and witnesses said warplanes on Friday also struck targets in Jabalia in the north, Gaza City and in the center of the Palestinian enclave. Witnesses also reported artillery shelling east and north of Gaza City. The Israeli occupation army said Palestinian fighters fired 33 rockets from Gaza, wounding a civilian and a soldier in the south. 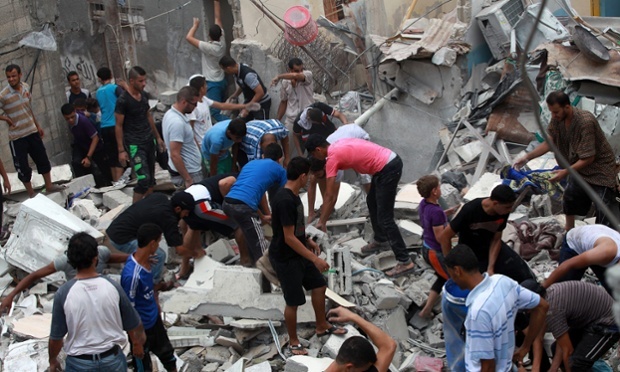 Hamas has not claimed responsibility for any of Friday’s rocket attacks. Claims instead came from rival armed factions including Islamic Jihad and the Popular Resistance Committees. In Gaza, some families who had returned home during the truce trickled back to shelter at UN-run schools. At one school in Al-Tuffah in Gaza City, hundreds of refugees were seen living in classrooms. An Israeli government official said Israel would not negotiate with Palestinians about renewing the truce in Gaza as long as militants continued to launch rockets, Reuters reported. Washington said it will not directly engage in the mediation efforts in Cairo between Palestinian resistance factions and Israel, because Hamas is designated as a foreign terrorist organization by the State Department. In her daily press briefing on Thursday, the U.S. State Department’s deputy spokesperson Mary Harf reiterated that her country would not be engaged in direct negotiations with Hamas officials. Israel had earlier said it was ready to agree to an extension as Egyptian go-betweens pursued negotiations with Israeli and Palestinian delegates. Hamas said Palestinian factions had not agreed to extend the truce, but would continue negotiations in Cairo. The Palestinians had wanted Israel to agree in principle to demands which include a lifting of the blockade on the Gaza Strip, the release of prisoners and the opening of a sea port. The armed wing of Hamas released a statement late on Thursday warning Palestinian negotiators not to agree to an extension unless Israel offered concessions. Israel has shown little interest in easing its naval blockade of Gaza and controls on overland traffic and airspace. A source at Cairo airport said the Israeli delegation left shortly before the truce expired. He said the Israeli visit had lasted nine hours, longer than the previous two visits this week, as Egyptian mediators pushed the two sides to renew the truce. There was no immediate comment from Egypt. This entry was posted in Middle East and tagged Assault, Gaza, israel, Truce. Bookmark the permalink.